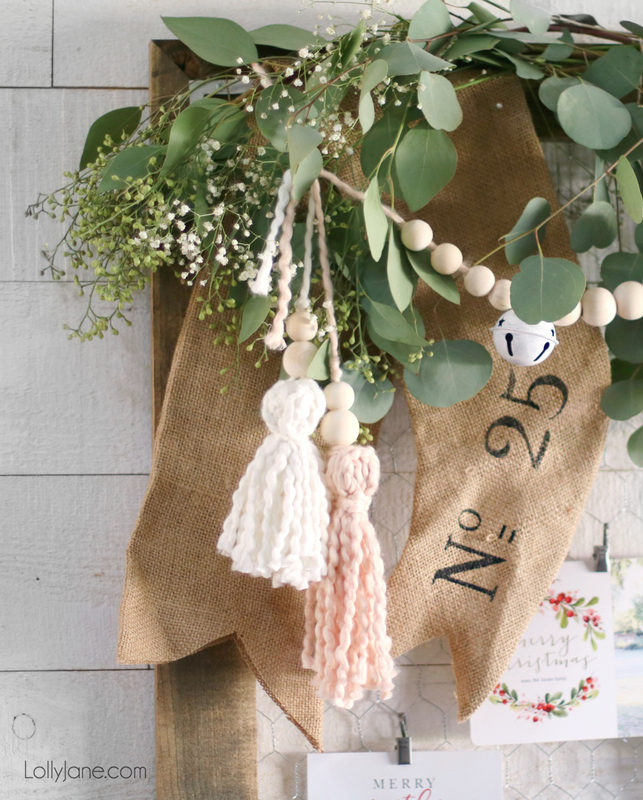 Make this Easy DIY Wood Bead Yarn Tassel in a matter of minutes to INSTANTLY spruce up a mantel, garland, frame, or gift! 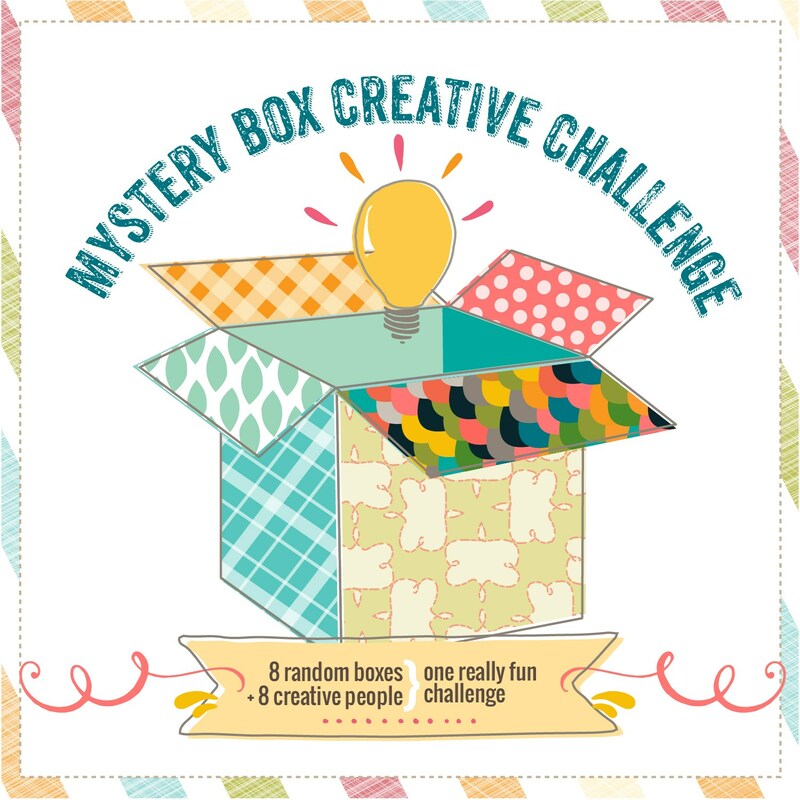 Bonus: see our upcycled stocking that was sent to us in part of a fun “mystery Box Creative Challenge” and what we turned it into, wow! Now let’s get to the fun part! 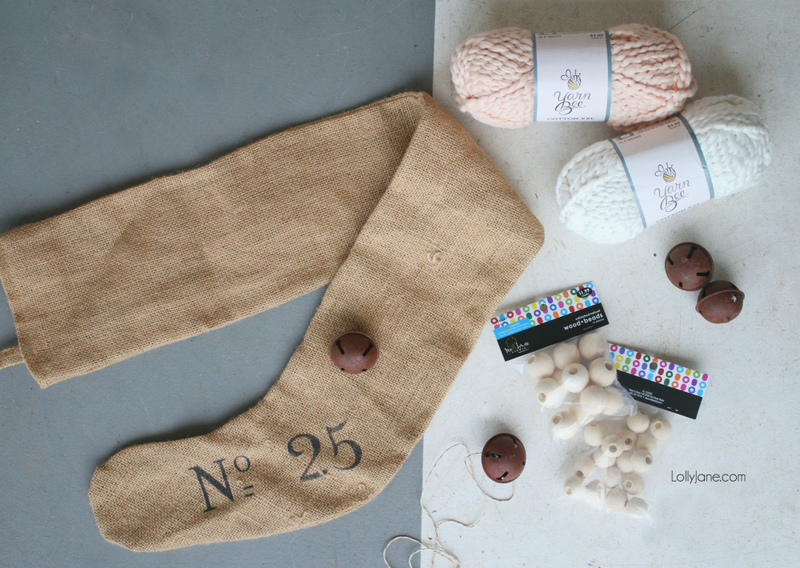 Here is what our cute friend Karianne from Thistlewood Farms sent: a pretty burlap stocking, complete with 4 rustic jingle bells. She was good to us, this is easy enough to decorate with as it’s pretty cute as-is! We knew right away what we were going to do to make this “ours” and fit into our own Christmas home decor. 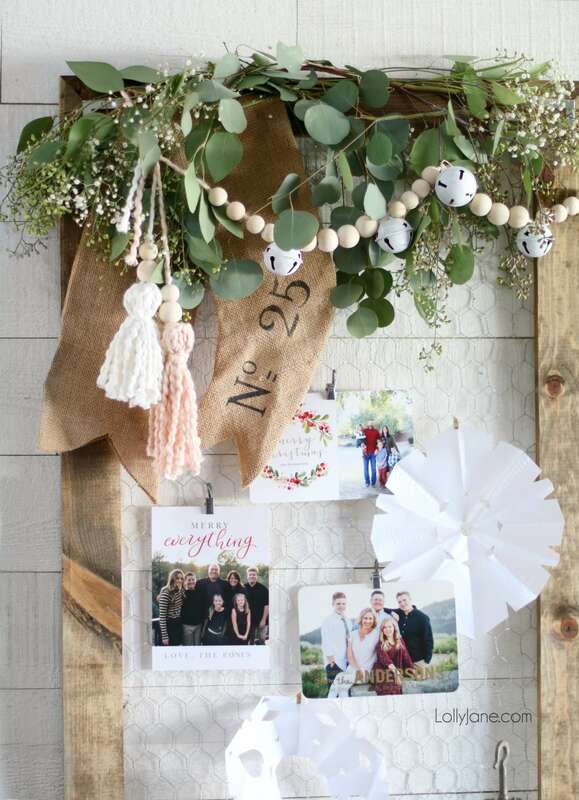 We made a quick Hobby Lobby run and spied these spools of cozy yarn in yummy hues then snagged a few bags of natural wood beads to polish off the boho look we were going for. 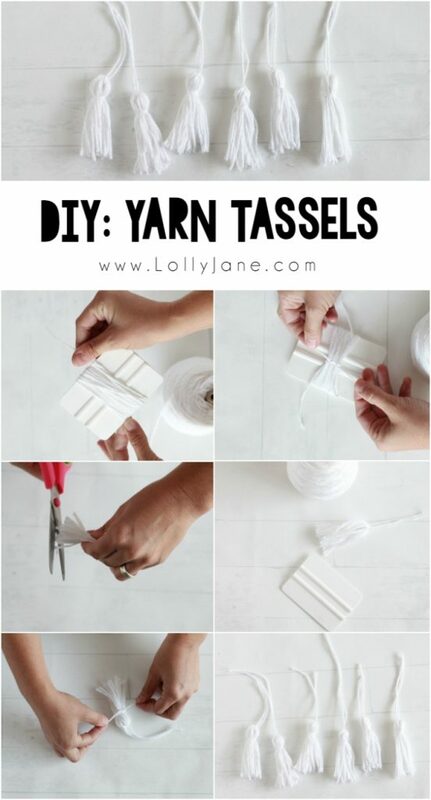 Top with our DIY Wood Bead Yarn Tassels! 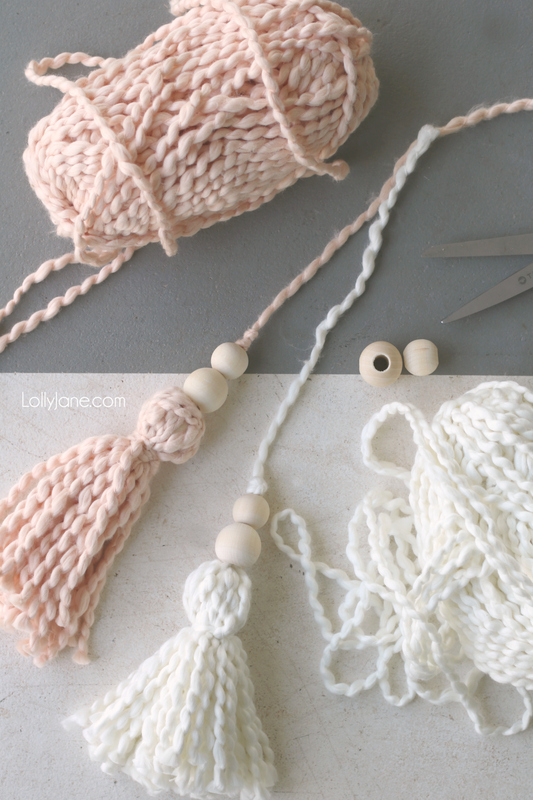 Now that you know how to make a tassel from yarn, to spruce it up a bit and pull off the boho vibe, just slide 2 natural wood beads on over the tail (larger on the bottom) then tie a knot at the end to secure. You can even use the white yarn only then paint the beads red and green if traditional is more your style. SO simple! 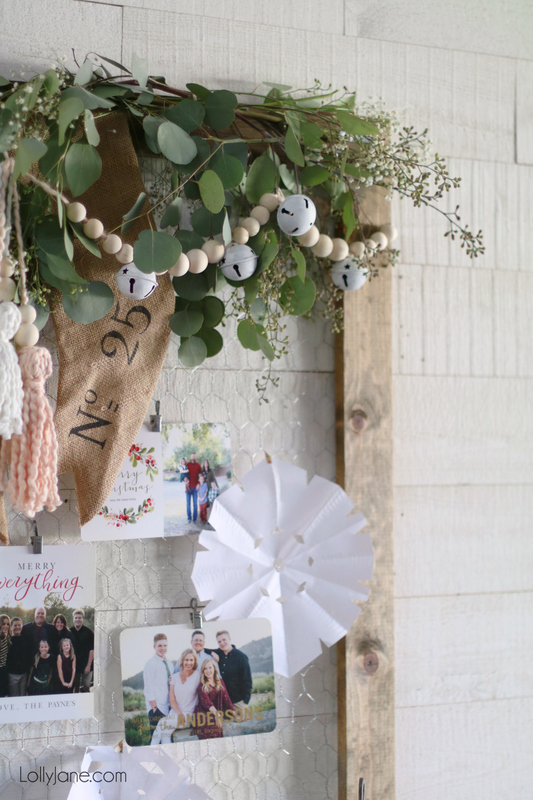 We threaded 2 different sized wood beads with the painted white bells to create a simple but matching whimsical wood bead bell garland and love it against fresh eucalyptus leaves from my front yard tree. 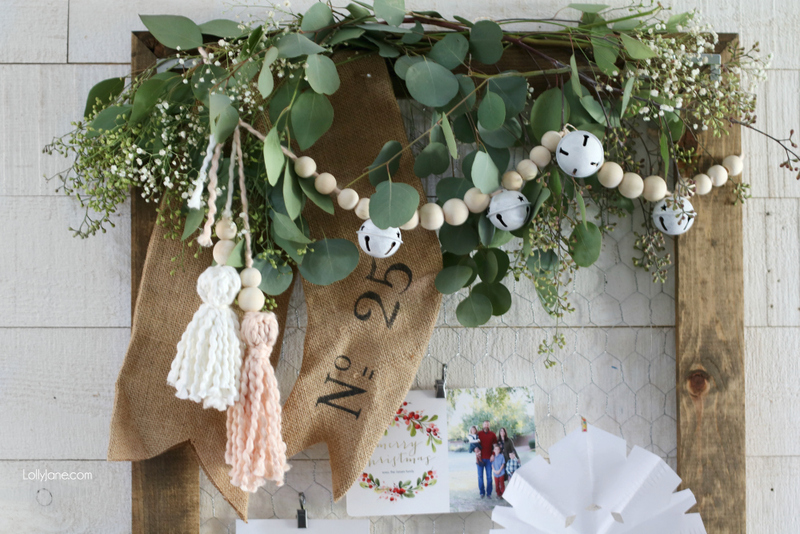 I also created a little vignette to play off of the beaded garland + tassels and love all the natural wood beads going on in this space! Did you spy those freshly painted white jingle bells cut off from Karianne’s stocking? Love! 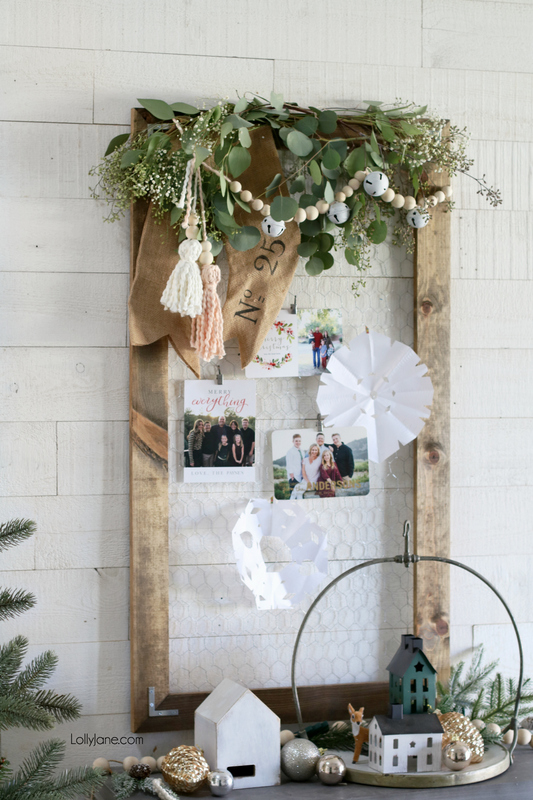 The white pairs so nicely with the natural bead and I love the touch of Christmas it brings in! That’s it for what we’ve got! 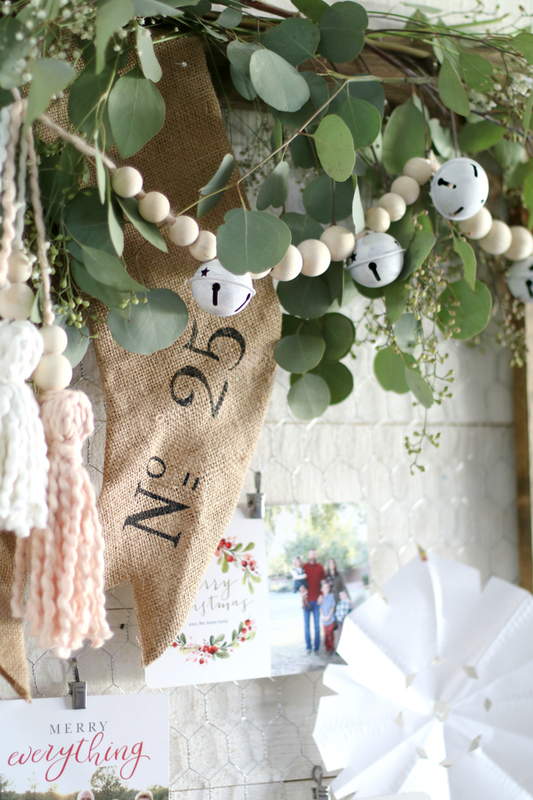 Now head on over to cute Annie of Zevy Joy to see what she did with the trio of decor we sent her… yes, there are tassels involved! 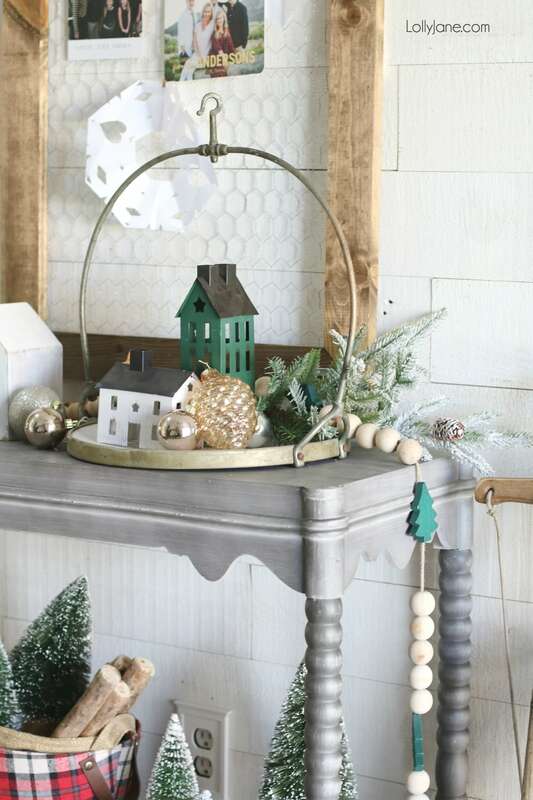 LOL Click through these other blog pal’s projects to see what they upcycled into gorgeous ideas that are sure to get you in the Christmas mood and ready to upycle something around your own house! 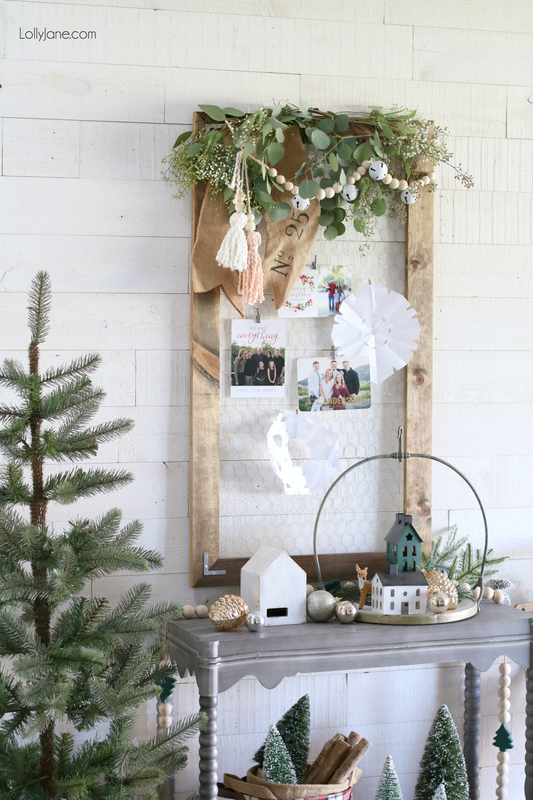 Love the garland and how you transformed it. You are amazing my friends! Gorgeous, friends! Love it all! FIRst let me say this is the cutest idea, sending what you were not using and passing on to a friend. YOu are so creative with what was sent to you. Cute, cute after holidays I I’ll be making the beads.thanks for sharing. 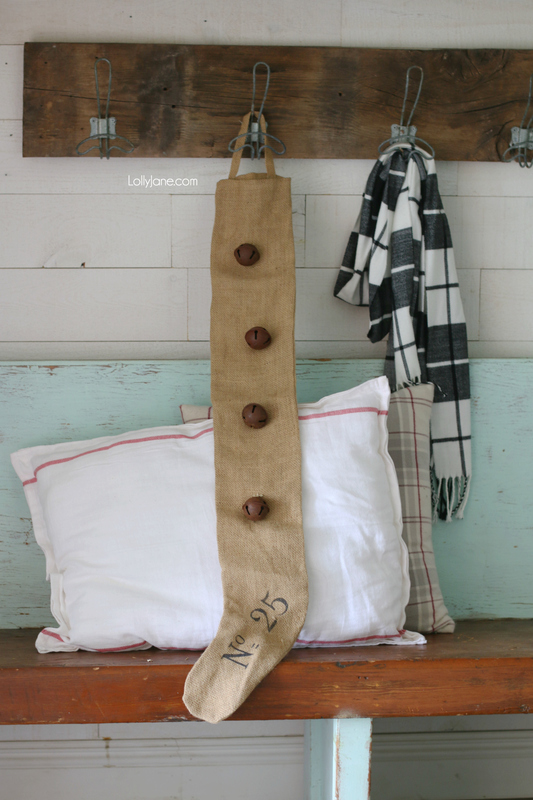 Absolutely love what you did with the burlap stocking now bow , painting the bells and making a garland with wooden beads !!! Very creative !!! I love those tassels and wooden beads! Y’all are ingenious! So…what kind of ‘eucalyptus branches from my yard’ are those? I’d love the details on that so I could plant something! Hi Angie. My dad planted this tree 40 years ago. I bought the house since then and it’s now over 70′ tall. It’s a Eucalyptus Polyanthemos.